Owner of the buffalo, Kapoor Singh, a farmer invited over 2000 guests from across the state to attend the function at Singhwa Khas village in Hisar district. CHANDIGARH: A Haryana village is all decked up to give a grand farewell to a buffalo, which was recently sold for Rs 25 lakh to a farmer from Andhra Pradesh. Owner of the buffalo, Kapoor Singh, a farmer invited over 2000 guests from across the state to attend the function at Singhwa Khas village in Hisar district. The farewell party is expected to cost him around Rs 2 lakh. According to Singh, farmer Rajiv Sarpanch from Andhra Pradesh who bought the buffalo on Tuesday would arrive on Sunday to take the animal home. Sarpanch had spotted her at Muktsar cattle fair in Punjab. Special silver ornaments worth Rs 25,000 have also been bought to deck up Lakshmi, which was the show-stopper buffalo at the Murrah catwalk in Jind two years ago. Senior government functionaries, including director general of state animal husbandry and dairy department KK Dangi, would also attend the function. "The latest deal would boost the morale of farmers to rear good animals in Haryana," Dangi said. Lakshmi, which was adjudged the best buffalo at Muktsar cattle fair earlier this year, has so far bagged prizes worth Rs 3 lakh in milk yield and other contests. One of its calves was also sold for Rs 3 lakh. "I did not want to sell the buffalo. So, I had quoted an exorbitant sum of Rs 25 lakh for the buffalo to be sold. Rajiv had offered me Rs 19 lakh a few months ago. However, this time, we sealed the deal as he seemed determined to acquire Lakshmi. He also gave me Rs 5 lakh as advance," said Singh, who gave Rs 50,000 each to two middlemen for brokering the deal. According to Kapoor, he purchased Lakshmi for Rs 2.5 lakh two years ago. During the first lactation period, she gave 22.5 litres of milk daily. Her highest milk yield in one day is 28 litres, he said. Four-and-a-half year-old Lakshmi's third calf is due next month. Singhwa Khas is one among the 70 villages, which has been declared as ideal Murrah villages by Haryana government for owning cluster of top quality buffaloes. Known worldwide for its high yield, the Murrah buffalo produces up to 32kg of milk a day, almost double than that of an ordinary buffalo. 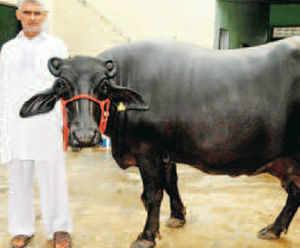 Due to its beautiful body as compared to other buffaloes, it is called 'black beauty' and 'black gold' in Haryana. Normally a good Murrah can fetch between Rs 2 lakh and Rs 2.5 lakh. 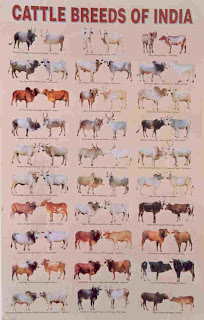 Due to its demand, the Central government in 2008 had asked Haryana to provide 20,000 Murrah bulls so that cross-breeding can be done with regular buffaloes in different states. With the Murrahs' popularity shooting up, cattle owners from metros like Delhi, Mumbai, Hyderabad and Bangalore come to Haryana to buy the animal.